It’s forty years since Paul McCartney wrote The Long and Winding Road. The story I intended to write doesn’t go that far back, but its roots go much further, as I found out. In May 2010, the Central Council published The New Ringer’s Book. That was the culmination of a very long project. At the start of the project, I was a mere observer from the sidelines, but by the end I was heavily involved. This article is intended to give some insights into what was far more than just ‘writing a book’ It is based on a combination of old minutes and personal notes, as well as my recollections after I got sucked into the story. The aim was ‘to replace the Beginners Handbook’. This came in the wake of an earlier, abandoned project with the same broad aim, which began long before I joined the CC Education Committee. So I looked further back, at Central Council reports (on the web and in The Ringing World) and I found found that the Beginners Handbook was itself ‘a replacement’. In 1933, the CC produced a booklet with with the rather prolix title Hints for Instructors and Beginners in the Proper Method of Handling a Bell Rope. It was generally referred to as Hints to beginners – a gross misrepresentation, as the opening paragraph says: ‘These remarks are addressed mainly to the leaders of bands of ringers’. It sold well, and was reprinted in 1939 and 1948, but some disappointed ringers returned copies as ‘unsuitable for beginners’. In 1956 there was a proposal to revise it ‘in the light of recent advances and experiments in teaching technique’ so that it ‘should contain not only sections intended primarily for instructors ... but also a section on these matters which can easily be understood by beginners’. After debate, Council formed The Beginners Handbook Committee. Three years later it had completed An Elementary Handbook for Beginners in the Art of Change-Ringing and it asked to be wound up. To keep down the cost, Council ordered 5000 copies – expected to last ten years – but they sold out in a year. 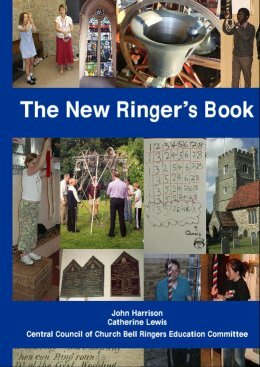 The book was in three parts: A bell and how to ring it (7 pages plus pictures), Change ringing (19 pages), Duties of a ringer and the band (1 page). In the late 1970s the Education Committee decided that the book needed updating and revising. Thus a new book was published in 1981. It was slightly longer, and organised differently. Whereas the original book had given advice on various aspects of ‘how’ to ring a bell, the new book described the process of being taught (assuming that your tutor used the same teaching sequence) so it was mainly ‘what’ to do, with somewhat less on ‘how’ to do it. (My copy still contains the four A4 sheets of supplementary notes that I wrote for pupils I taught during the 1980s, to cover essential things that the book didn’t cover.) The book looked more modern, and was innovative in its use of cartoons, some of which a modern politically correct author might hesitate to use. Six years later, the Committee suggested a further change, since ‘the style of writing and presentation of educational publications is a vital factor in getting the message across’. The Committee hoped to revise the book when it was to be reprinted a few years later. It invited Council members to make suggestions for its future style. Work began on the replacement book, to be called Belfry Steps, and by 1993 it was reported as more or less complete. But at that point the Committee underwent an almost total change of membership, and no longer included the book’s authors. The new Committee was keen to realise the result of the authors’ work, but the book never made it to publication. The need was still there, but the Committee chose to delay further work until after completion of its other major project, The Tower Handbook. In June 1997, the Committee agreed to start work on a replacement for the Beginners Handbook, with all its members invited to submit ideas for its content. The minutes declare that it should be written to match the Tutors Handbook, which had been revised a couple of years earlier. This idea reappeared in the following minutes, which said that it should be ‘aimed at learners but set the agenda for the tutor‘. This ‘back door agenda’ for the book caused some problems later. The working group made limited progress over the next couple of years, by which time the pressure to complete it was growing. By now (January 2000) I was chairman of the committee. I was no longer sitting on the sidelines. Suddenly it was my problem. Applying typical ‘new broom’ management, I set an ambitious timetable that would complete by the end of 2000. With hindsight I should have tried to understand why progress was so slow rather than setting unachievable targets, which were of course not achieved. We should have learned from the Tower Handbook Project, where we spent half of the four years working out what we really needed to turn the vision into reality, which then gave a clear run to the two year task of writing, editing and production. We were three years into the Beginners Handbook project, without a clear consensus on the style and content, or even what we were trying to achieve. We wanted it to be ‘better’ and ‘more modern’. We also wanted it to be ‘at least as good as’ Pam Copson’s One per Learner, but we didn’t want to compete head on with such an excellent publication, but somehow to complement it. That proved a very tall order. A survey of 150 learners, few of whom had even seen the Beginners Handbook, had not yielded much. The project leader was no longer on the Committee. The working group was re-jigged. Some draft text was written, but it was drifting back towards the style of the old book. In 2004 I joined the working group, and we went back to basics, brainstorming a storyboard of the structure, together with key aspects of presentation and style. It still wasn’t easy, with a lot of debate and some disagreement, but when we moved forward to start writing, we had a better idea of where we were going. We wanted to address the new ringer, not the tutor. We wanted to ‘answer the sort of questions that new ringers are likely to ask and might not be told’, and we wanted to do it in a way that would make sense regardless of how the ringer was being taught. We wanted to cover ‘becoming a ringer’ in the full sense, and not just initial learning. So as well as explaining techniques and how to develop them, we wanted to give a vista of a future ringing career. When we began writing in earnest, we hoped to have a pilot copy available by the 2006 Council meeting. We missed that date, but pilot copies went out in late summer 2007. We had invited people to volunteer their learners as trial users, and we selected twelve with a mix of ages, background and geographic location. This was a vital part of the process, and the feedback was valuable, even if occasionally inconsistent (eg one person saying an explanation was too complicated and unnecessary, while others said it was really helpful). Perhaps the most useful result was that some copies came back with pages damaged or dislocated by the ‘spiral’ wire binding, and would not have survived many months intensive use. Our printer later came up with a far better solution, a thick plastic spiral (unlike the wire version, which isn’t really a spiral because the wire goes back and forward). This binding is used for school Student Planners, which get rough use, and means that the book can be folded back on itself with impunity. There was a lot of editing to do after the pilot version, and a huge amount of detail, as can be judged by the version numbers that we went through. Version 11 was the pilot, and version 32 was the one published. We also needed to replace the rough and ready action pictures we had used in the pilot (extracted from domestic video), so we arranged a photo-shoot using professional equipment early in 2008. After that it was into the long haul of getting everything right. Having two authors took much longer because we had many debates about points of detail, but it undoubtedly improved the end result. We lost some momentum with the Committee having two rapid changes of chairman, and the fact that I was no longer a member of it, but after much sweat, we finally delivered the result in time for publication at the 2010 Council meeting. It was a very long project, and it would be easy to criticise it. No doubt a commercial organisation could have enforced a more rapid result, but you can’t do that when everyone involved, not just the authors, are volunteers with busy lives. I prefer to focus on the fact that despite the setbacks and delays, we persevered with the vision, and produced a result of which all those involved can be proud. We believed that we could produce a significant advance on what had gone before, and that was worth working for. History will judge us on the result, but with nearly 2000 copies sold in the first couple of years, it looks encouraging.